In a recent article published in Nanoscale, researchers from the Nanomagnetism group at nanoGUNE have demonstrated the use of hybrid magnetic-plasmonic elements to facilitate contactless and selective temperature control in magnetic functional metamaterials. Compared to current global heating schemes, which are slow and energy-inefficient, light-controlled heating using optical degrees of freedom such as wavelength, polarisation, and power, enables efficient local heating schemes for the use in nanomagnetic computation or to quantify collective emergent phenomena in artificial spin systems. Single-domain nanoscale magnets interacting via contactless magneto-static interactions are key metamaterials for applications including magnetic data storage devices, low-power information processing, and studying collective phenomena in so-called artificial ices. These magnetic metamaterials are fabricated using electron-beam nano-lithography where any desired two-dimensional arrangement of thin-film magnetic elements with dimensions of a few hundred nanometers can be designed. The functionality of such magnetic metamaterials is determined by the capability to reverse the net moment of each nanomagnet to minimize the overall mutual magnetostatic interactions, which happens more quickly at elevated temperatures. Over the years, different heating schemes have been employed to drive networks of interacting nanomagnets to an equilibrium state, ranging from thermal annealing of stable magnets to the fabrication of rapidly-fluctuating ultrathin superparamagnetic elements. Currently, thermal excitation of artificial spin systems is achieved by thermal contact to a hot reservoir, either by heating the entire underlying substrate, or by an electrical current in a conductive wire nearby. All these approaches are energetically inefficient, spatially non-discriminative, and intrinsically slow, with time scales of seconds to hours, making it difficult to reach a true equilibrium state in extended frustrated nanomagnetic lattices. Furthermore, for implementation in devices of magnetic metamaterials, e.g. magnonic crystals and nanomagnetic logic circuits, global heating lacks the control, spatial discrimination, and speed required for integrated operation with CMOS technology. 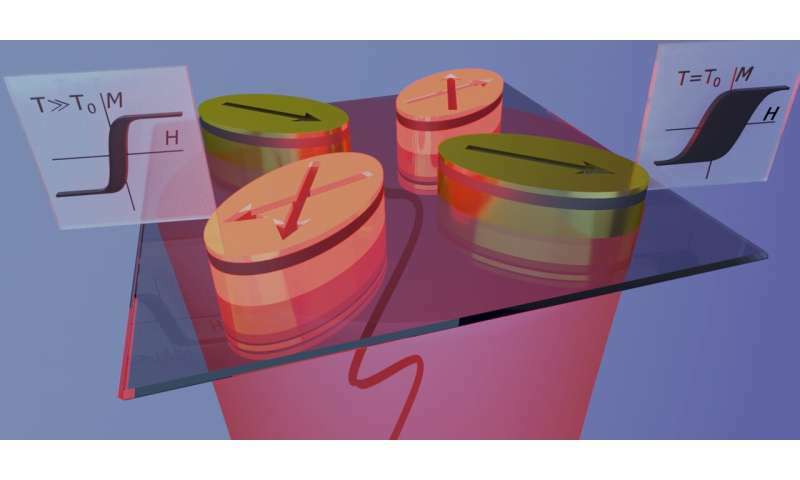 Applying a hybrid approach that combines a plasmonic nanoheater with a magnetic element, in this work, the authors establish the robust and reliable control of local temperatures in nanomagnetic arrays by contactless optical means. Here, plasmon-assisted photo-heating allows for temperature increases of up to several hundred Kelvins, which lead to thermally-activated moment reversals and a pronounced reduction of the magnetic coercive field. Furthermore, the polarization-dependent absorption cross section of elongated plasmonic elements enables sublattice-specific heating on sub-nanosecond time scales, which is not possible with conventional heating schemes. The authors experimentally quantify the optical and magnetic properties of arrays of single hybrid elements as well as vertex-like assemblies, and present strategies how to achieve efficient, fast, and selective control of the thermally-activated magnetic reversal by choice of focal point, pump power, light polarization, and pulse duration.